Home brewers love to talk about hops. What flavor they added to the beer. How bitter they made the beer. But it doesn’t stop there. There are five main things that hops do for beer. Depending on what hops you use, they can add a bitter flavor to balance out the sweetness of malt. They can add a spicy flavor and a floral/herbal aroma to beer. They prevent bacterial from growing in your beer and they’re a natural clarifying agent to reduce the cloudiness in your beer. In other words, hops play a pretty important role in your beer. 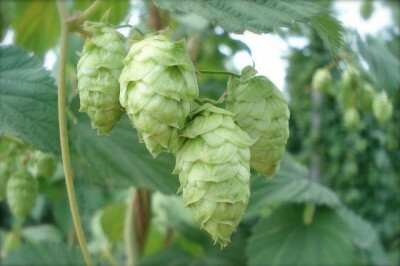 Hop plants are a vine plant that can grow up to twenty-five feet tall and each plant can produce up to two pounds of hops every year. They are mainly grown in Europe and North America. They are distantly related to the hemp plant. Whole: Whole hops are easy to strain from your wort and provide the best aromas, but they soak up the wort which means you will lose some of it when you strain it. Plug: The plug form is good because they retain the freshness for the longest and having fresh hops is key to getting the most out of them. They come in convenient half ounce units, but can be difficult to break apart if your recipe calls for smaller than half an ounce. Also, they soak up the wort similar to whole hops. Pellets: Pellets are probably the most common form of hops out on the market. They are easy way and store well. However, they tend to end up in sludge at the bottom of brew pots that is difficult to strain. Plus, the aroma is slightly less than other forms of hops. Hops aren’t just used for beer. It’s used as a herbal medicine to treat anxiety, restlessness, and insomnia. Keep hops away from your dogs! Hops are toxic to dogs.